The rising costs of electricity bills are well-documented. As people struggle for money, many are looking for ways to reduce what they spend on utilities bills such as electricity. There are lots of ways you can save money and get your electricity bill as low as possible. The costs and services of different electricity suppliers vary enormously and it can be hard to know which will save you the most money. If you’re on a budget and looking to reduce your electricity bill, you can compare suppliers quickly and easily using an online comparison site such as Uswitch. In the current climate of energy bills looking set to rise even further, it can pay to think about capping. Although capping your electricity bill can cost you some extra money on a month to month basis, it could save you a significant amount of money in the long run. What capping your electricity bill means is that by paying a slightly higher amount each year, the electricity company agrees that they will not raise the unit cost of your electricity for a fixed period, say one or two years. You will still pay for the electricity that you use though. Loft insulation is the first thing you should look into as this is where the most heat escapes. New houses are built with loft insulation but you can buy fibreglass loft insulation cheaply for older houses and it is easy to install. You may not even have to spend your own money to insulate your home. Renters as well as homeowners may be eligible for insulation grants. Grants are usually administered by the Local Authority so the best course of action is to check their website or contact them directly. You could actually save money by replacing some of your household electrical appliances. As much as 47% of the electricity you use in your home is through domestic appliances. Experts estimate that energy efficient appliances could save householders up to £200 a year. Choose products designed with energy efficiency in mind. There are many ways you can use less electricity around the home and therefore save money on your electricity bill. The obvious but often ignored one is turning off all electrical appliances and lights when they are not in use. 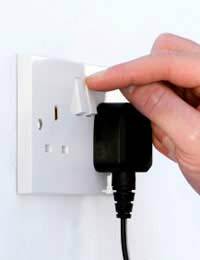 Use time switches to turn all your electrics off at night, even if you are not in. Use energy-saving light bulbs. Although they do cost slightly more, they will save money on the long run as they use much less electricity. Seal up drafts under doors and around windows. This is a common way for heat to escape. Only use dishwashers and washers when there is a full load.